It’s that time of year again when the temperatures begin to drop and we start talking to you about the importance of fall car care in Michigan. Fall is the time between the extreme highs and the extreme lows of Michigan weather. This is the time between sweating in the hot sun, and being extra cautious of slippery icy conditions. When it comes to car care, fall is the best time to get your car winter ready before the extremely low temperatures start to come. Check or replace belts or hoses. Most hoses are made of a rubber material. Over time, change in temperature can cause rubber to become brittle or damaged. Check all hoses and belts and replace when necessary. 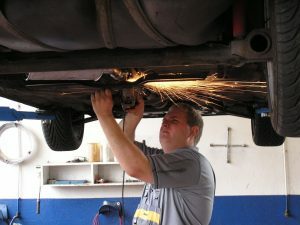 Brake system repair becomes more and more common during the colder temperatures. Save yourself time and hassle by getting brake repairs done in the early fall months. Tire replacement may be necessary at the end of summer beginning of fall. As frost and ice begin to form on Michigan roads, they become slippery. Having tires with no tread or traction on them can be dangerous. Some car owners even prefer to have a separate set of tires stored just for winter. Mr. Muffler continues to provide full service auto care in Michigan all year round. Although fall may be the busiest time of year for car repairs, our professional auto mechanics in Westland, near Canton and Livonia, are at your service any time of year. Please Contact us today to schedule your car check up and see what type of repairs you may need before the temperatures drop.